Please submit the order form at the reception by 7 pm at the latest, so we can bring you your order to the apartment at the desired time. Equipement for 4 x breakfast (2 pers. / 2 nights). 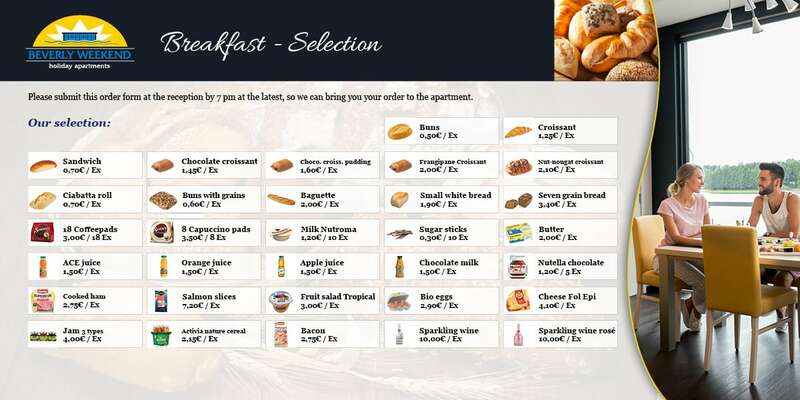 If you wish, we can equip your apartment with the following products: Have breakfast when and how you want. For a relaxed morning. Only on Tuesdays or Thursdays, sometimes on Saturdays, please ask. After 7pm the spa and the swimming pool can be booked for private use. Would you like to improve your stay or do you want to give your partner a gift or say “I love you » to him/her. Our arrangement « Je t’aime » could be a stylish answer. Book a service offer in the value of 55€ and get the 2nd for free. Only by reservation and availability! Offer only valid outside school holidays. Professional chauffeur service for airport transfer, excursions, courier service (up to 5 people including luggage).